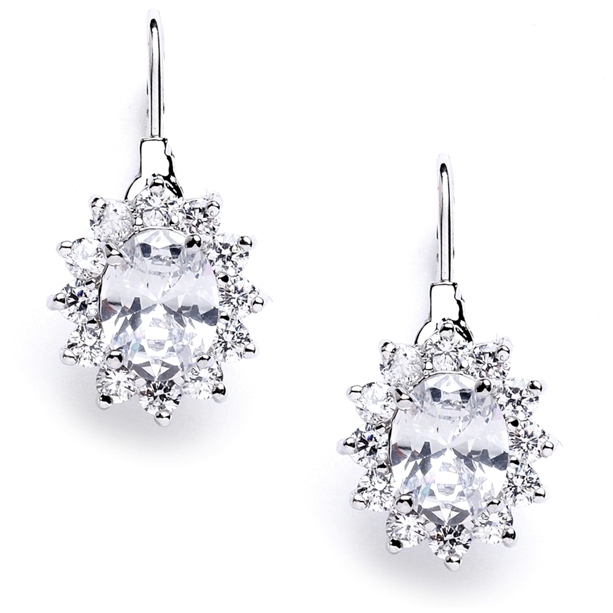 * Our classic Oval CZ earrings with a brilliant starburst frame are 1" h x 1/2" w with AAA Cubic Zirconia & lever backs for a look of high-end designer jewelry at a fraction of the price. * Perfect for elegant evening wear or your bride's special day. * Mariell's glamorous bridal earrings feature an oval Cubic Zirconia center surrounded by CZ brilliants on a genuine silver rhodium lever back setting. * These high quality classic earrings are a beautiful and affordable addition to your store's bridal jewelry collection and they're sure to be a great seller among fashion conscious shoppers of all ages. * Their tailored design makes them perfect to wear after the special event for parties and nights on the town!